There are few things that we can all agree on in this world. One of those rare things? I think we can all agree that the grilled cheese is the epitome of a sandwich. Two grilled pieces of buttery bread sandwiching mounds of melted cheese? Who among us can say that doesn’t sound like pure bliss? But even the best things could use a little upgrading every now and again, and our beloved grilled cheese is no different. With some creative thinking, you can use the delicious blank palette of a classic grilled cheese and make some seriously superb sandwiches. Check out these 13 yummy ways to makeover your everyday grilled cheese. We all know that the best grilled cheeses are made with bread slathered in plenty of butter. But what if we told you that you could make an even better grilled cheese without butter? Blasphemous, we know. Try swapping butter for mayonnaise on your bread – it will make for a perfectly crispy, golden, and flavorful grilled cheese that not even butter could make. Who says a grilled cheese HAS to be made on bread anyways? For a sweet twist on this classic sandwich, ditch your regular white bread and get creative. Our favorite replacement? Grilled cheese on a donut. Melted cheese all over a sweet glazed pastry? Talk about salty and sweet. Grilled cheeses can be healthy! It doesn’t have to be all bread and cheese, you know (although, if it was, that would be fine with us.) Some sauteed veggies can really amp up the flavor of your sandwich and give you some extra vitamins and nutrients. Try this spinach and artichoke grilled cheese for starters. While we all love the classic shape of the grilled cheese, it’s fun to get a little playful every now and again. Slice up your normal grilled cheese and make dipping sticks, perfect for you or the kids! Want to take it to the next level? Wrap your grilled cheese strips in bacon. Yeah. We went there. Just like the bread doesn’t HAVE to be bread, the cheese in your sandwich doesn’t HAVE to just be cheese! Defy convention with a dessert grilled cheese like this Nutella and blue cheese grilled cheese. Dessert for dinner? Yes, please. Whether you have a picky eater at home or you yourself are the picky eater, there’s always someone who doesn’t like their sandwich crust. Take the crust out of this equation with this amazing hack! It will turn your sandwich into an amazingly gooey grilled cheese pocket. If you want to get into semantics, it is technically called a GRILLED cheese sandwich. As Alton Brown would say, “that means a sandwich with grilled cheese.” Try his amazing recipe in which he grills his bread and cheese to get the most amazing flavor you’ve ever tasted. There is nothing wrong with a little extra cheese. Or maybe a LOT of extra cheese. Of the mac variety. That’s right, you can stuff your sandwich with mac and cheese and grill it! This very well could be called the ultimate meal. What, you’ve never heard of an inside out grilled cheese? Welcome to the party, friends. Let’s just say that if you like your grilled cheese extra golden and crispy on the outside, melting some cheese on both sides of the bread will be your dream come true. No, we’re not asking you to actually create bread from scratch – but if you wanted to, you could this amazing sourdough recipe. Actually, we were talking about something much easier and MUCH more delicious: tater tot bread. All you need are your usual grilled cheese fillings, a waffle iron, and all of the tater tots. Things just got interesting. Having an affinity for one type of cheese isn’t a bad thing, but for the purposes of the ultimate grilled cheese, you might want to mix it up! Try combining different kinds of cheeses in your sandwich for extra flavor and gooey filling. One of the sad things about traditional grilled cheese is that only one side of each slice of bread actually gets grilled. Well, we say equal rights for all sides of all bread! 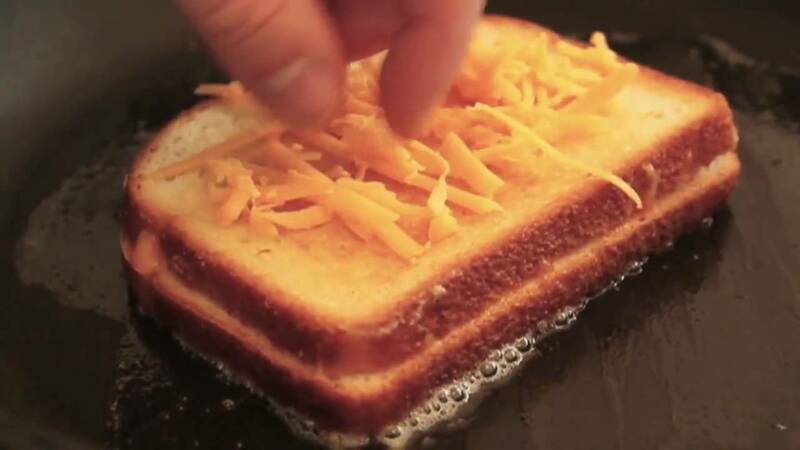 Toast your bread before you make your grilled cheese, so you get that crispy crunch throughout your whole sandwich. The panini press doesn’t just give sandwiches awesome ridges, it also does a grade A job of toasting your sandwich! And what other sandwich deserves to be perfectly toasted than the sandwich of the hour: the grilled cheese. Using your panini maker is a mess-free way to get the perfect sandwich – crispy on the outside, melted on the inside. Do you upgrade your grilled cheese in a fun way? Share your recipes in the comments section below.